and the subject of our wood-cut might naturally tempt us to be mirthful and extravagant. 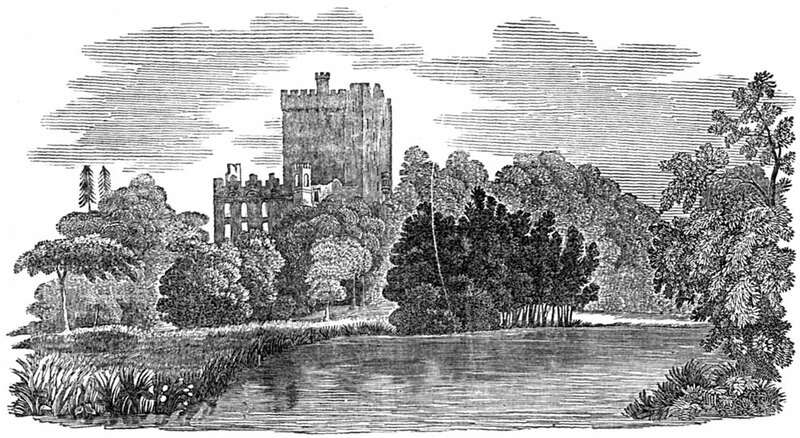 But despite of Milliken’s excellent song — we are not in the vein, and feel more disposed to melancholy than gaiety at sight of a noble castle, the seat of one of the most ancient, and most unfortunate princely families of Ireland — the Mac Cartys of Desmond. "Hic. Jacet. Cormacus. fil. Thadii. fil. Cormaci. fil. Dermitii. magni. Mc. Carthy, Dnus. de. Muscraigh. Flayn, ac. istius. conventus. Primus. Fundator. An. Dorn. 1494." The castle remained in possession of his descendants till forfeited with the extensive estates belonging to the lord Muskerry and Clancarthy, in the war of 1689, after which it came into the possession of the Jeffrey's family, to whom it still belongs. A pension of three hundred a year was however allowed to this unfortunate nobleman, on condition of his leaving the kingdom. "With this," says Smith, "he retired to Hamburgh on the Elbe, and purchased a little island in the mouth of that river, from the citizens of Altona, which went by his name." He died here October 22, 1734, aged 64, leaving two sons, Robert, a captain in the English navy, commonly called Lord Muskerry, and Justin Mac Carthy, Esq. Lord Muskerry having fallen under suspicions of being attached to the house of Stewart, "which had on a former occasion," remarks Charnock, in his Biographia Navalis, "proved the ruin of his father, was ordered to be struck off the list of naval officers, on the 16th July, 1749. He afterwards entered into foreign services." The military and historic recollections connected with Blarney are doubtless of sufficient importance to give an interest to the place: but to a curious superstition it is perhaps more indebted for celebrity. A stone in the highest part of the castle wall is pointed out to visitors, which is supposed to give to whoever kisses it the peculiar privilege of deviating from veracity with unblushing countenance whenever it may be convenient — hence the well-known phrase of "Blarney." The grounds attached to the castle, as I before observed, though so little attended to, are still beautiful. Walks, which a few years since were neat and trim, are now so overrun with brambles and wild flowers as to be passed with difficulty. Much wood has also been cut down, and the statues, so ridiculously enumerated in a popular song, removed. A picturesque bridge too, which led to the castle, has been swept away by the wintry floods, and, with the exception of a small dell called the Rock Close, every thing seems changed for the worse. In this romantic spot nature and art (a combination rather uncommon in pleasure grounds) have gone hand in hand. Advantage has been taken of accidental circumstances to form tasteful and characteristic combinations; and it is really a matter of difficulty at first to determine what is primitive, and what the produce of design. The delusion is even heightened by the present total neglect. You come most unexpectedly into this little shaded nook, and stand upon a natural terrace above the river, which glides as calmly as possible beneath. Here, if you feel inclined for contemplation, a rustic couch of rock, all festooned with moss and ivy, is at your service; but if adventurous feelings urge you to explore farther, a discovery is made of an almost concealed, irregularly excavated passage through the solid rock, which is descended by a rude flight of stone steps, called the "Witches' Stairs," and you emerge sul margine d'un rio, over which depend some light and graceful trees. It is indeed a fairy scene, and I know of no place where I could sooner imagine these little elves holding their moon-light revelry. From The Dublin Penny Journal, 8th September 1832. Neill's Hill Station and surrounding area. 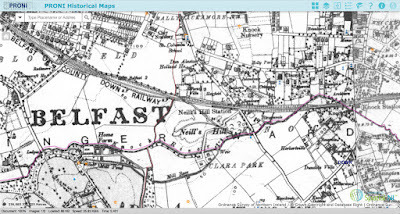 OSNI Historic Third Edition Map 1900-1907. When looking into the history of a local area information can be found in some unexpected places. As an example I present the case of Boyd v. Keenan in 1908. This case, covered in the court reports of the major newspapers, was a suit for the recovery of moneys relating to the maintenance of a road, but in doing so, however, it gives some insight into the area around Neill's Hill and the transcript below is that from the Irish News, 20th May 1908. Neill's Hill was a railway halt on the Belfast and Co. Down Railway which ran from Comber to Belfast. Situated in the townland of Ballycloghan it served the nearby village of Ballyhackamore. The contemporary map above shows the station and surrounding area, and would indicate that the sandpits mentioned were situated between the station and the Knock River at Clara Park. The area now known as Sandhill Gardens and Sandhill Parade. This was a civil bill action in which Henry Boyd, William Sinclair Boyd, and Robert Boyd, of 93 Ann Street, agents, sued Jacob Walter Keenan, 36 Corporation Street, shipbroker, to recover the sum of £45 9s 6d, money paid, laid out, and expended by the plaintiffs for the use of the defendant, at the request of the defendant, under an agreement dated 16th February, 1897. The case was tried before a jury. Mr. T. J. Campbell (instructed by Messrs. Joseph Donnelly & Co.) was for the plaintiffs, and Mr. A. J. Lewis defended. Mr. Campbell said they sought to recover £45 9s 6d, money actually paid for the benefit of the defendant under an agreement dated February 16th, 1897, and under which agreement plaintiffs were bound to keep a road in proper repair. The road was used by defendant in connection with an excavation of sand near Neill’s Hill Station. Defendant, who was a shipbroker, started business in the sand line in 1905, and he used the road to cart the sand from the place where it was procured. In the year 1897 the road in question was merely a private way, but since defendant began to dig and cart sand it had been used more than formerly. Heavy loads of sand were daily carted over the road, which was in constant need of repair. These repairs had been done by the plaintiffs, who now sought to recover for work extending over a period of twenty months. Mr. Henry Seaver. C. E., deposed that the road was a little over three hundred yards in length, and led from Neill's Hill Station to some villas. Witness also deposed to the contract which was entered into in 1897 relative to the repair of the road being carried out by plaintiffs, and added that in 1905 defendant developed some sand pits which led to heavier traffic passing over the road than previously. The plaintiffs did not use the road themselves. Witness described the effect of heavy traffic passing over the road, and said more frequent repairs were necessitated. He supervised the work, which was done at the lowest possible cost. Cross-examined by Mr. Lewis, witness said the cost of repair was not excessive, considering the amount of traffic passing over the road, which was constructed in the first instance for light traffic. He admitted the centre of the road was higher than the footpaths on either side. Evidence was also given by Mr. Francis Quinn, who made the road, to the effect that the expenditure on the road was fair and reasonable. He also deposed to the agreement between Mr. Thomas Tier, who formerly owned the road, and plaintiffs. James Shaw was also examined, and this closed plaintiffs' case. Mr. Lewis, opening the case for the defence, said he and others were growing old in this litigation, about which there was one peculiar circumstance. It was that at no time had they seen any of the plaintiffs in the witness-box. 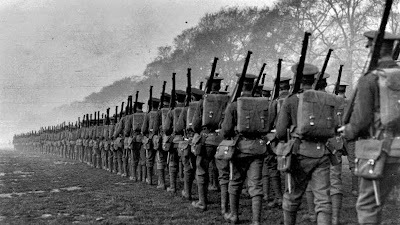 Keenan was a man who began as a common soldier. He saved sufficient money to buy a little property, and he had his little all in that property at Neill's Hill. Originally the lease was granted by the representatives of Sir Thomas M'Clure to a man named Tier, who was bound by covenant to erect certain houses on the land. The ground, however, turned out to be of such formation that it was necessary to level it, and finally he sold to Keenan for £2,000. Keenan developed the property more rapidly than his predecessor, and began to export sand, which evidently the plaintiffs did not like. Continuing, Mr. Lewis said the matter would turn upon the construction of an agreement entered into between Tier and the plaintiffs, and he submitted that the proper interpretation of that agreement was that the plaintiffs should provide the materials necessary for the repair of the road, and that Tier or Tier's successors should provide the necessary labour. Mr. Lewis then read numerous correspondence bearing on the subject, and, continuing, said the case was like the story of the boy and the frog — it was fun to Boyds, but death to Keenan, and he submitted that there was not fair dealing. Defendant, examined, said in 1905 he purchased Tier's interests in the estate. He developed sandpits in order to prepare the land for buildings, and plaintiffs also had sandpits in the neighbourhood. He alleged the plaintiffs first resisted his right to the road. In the terms of the agreement referred to, he applied to plaintiffs to supply him with gravel for repairs to the road, and they wrote telling him to take what gravel he required. He added that he was always anxious for an amicable settlement, and was still willing to pay his proportionate share of the cost of repair. Cross-examined, witness said the plaintiffs wrote him to the effect that gravel was too soft, and that macadam should be used for repairs. He admitted his liability to pay a fair and reasonable price for the maintenance of the road, but he contended the account rendered was excessive. Mr. Allan B. Stokes, C.E., was also examined. He was of opinion the road was not being kept in proper condition. The gravel to be found on the estate was suitable for repair work. Mr. Robert A. Boyd corroborated the last witness as to the view that the road was not kept in proper repair. A sum of £10 8s would keep the road in repair for a year. Benjamin Stafford, contractor, estimated bis price for adequate repairs for a year at £14. His Honour having summed up, the jury retired to consider their verdict. The jury found for plaintiffs in the sum of £31 1s, and His Honour granted a decree accordingly. 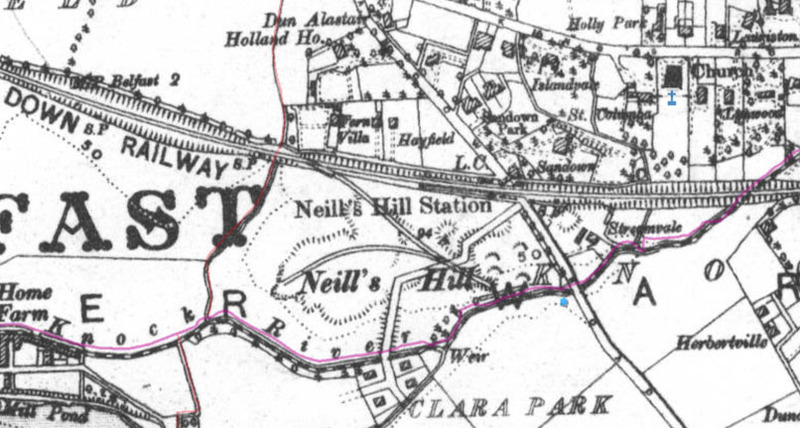 In this earlier map created for the Griffiths Valuation, Neill's Hill Station is indicated as a crossing although not named (the station being erected and opened in March 1890). 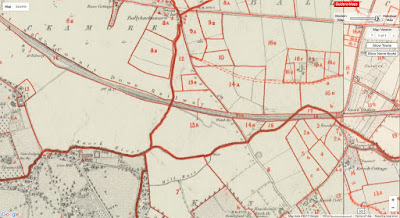 The land there being leased from the Belfast and Co. Down Railway by Robert Boyd – although one would suspect it was not the same Robert Boyd named in the suit. 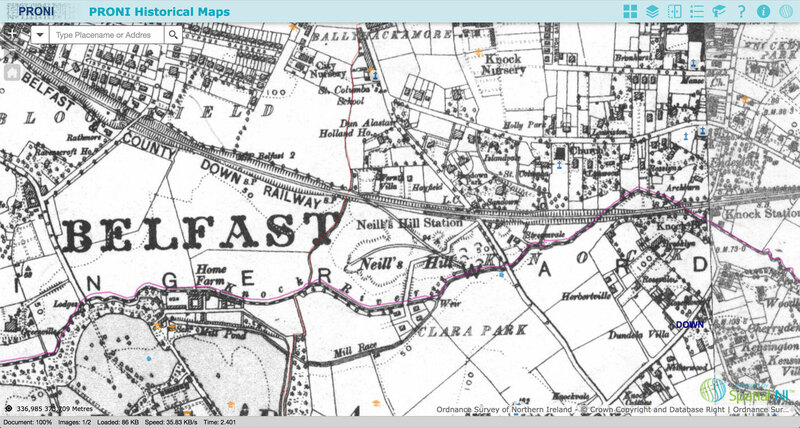 The area at that time being largely undeveloped and Cadgers Loaney which became the Sandown Road. 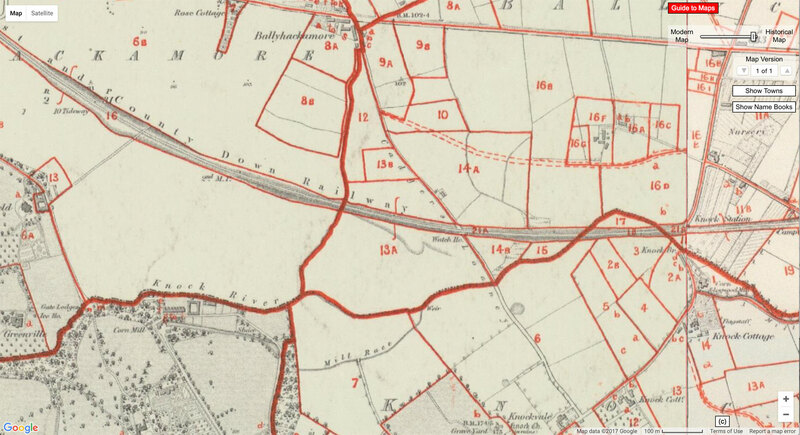 Robert is also recorded as the leaser of section 6 in the adjacent townland of Ballyhackamore through which the railway continued. Who sail for distant lands. Our loved ones on the deep. We think of thee at home! We can but wait, and watch, and pray. Since all the world is Thine! O speed that hallowed day! Poem from The Witness, 13th July 1917.